A summary of today’s show: Fr. Joseph Fessio, SJ, of Ignatius Press and a friend and student of Pope Benedict, recounts his own journey with the Holy Father, reflects on his papacy and future legacy, and delves this new book which is apropos for this Holy Week as we enter into it. 1st segment: Happy Patriots’ Day. Scot said today is much more than a day off or Marathon Day or a day when the Red Sox play with an early start. It is the start of Holy Week. We celebrated Palm Sunday yesterday and today is officially known in the Church calendar as Monday of Holy Week. 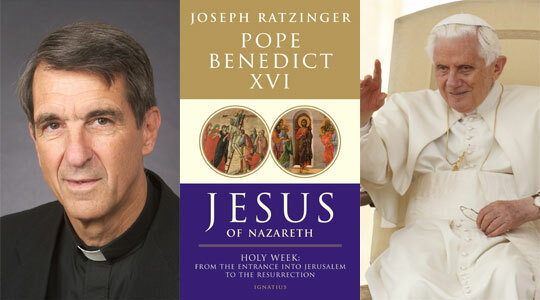 Pope Benedict XVI published a book last month entitled “Jesus of Nazareth: Holy Week: From the Entrance into Jerusalem to the Resurrection” to help us to get to know our Lord in a special way. On today’s broadcast we talked with the English-language publisher of that book, Fr. Joseph Fessio of Ignatius Press. But Fr. Fessio is much more than just the publisher. He has known Pope Benedict since Father was a graduate student and the Pope was known as Fr. Joseph Ratzinger. 2nd segment: Scot and Fr. Chris welcome Fr. Fessio. Fr. Fessio first met Fr. Ratzinger in 1972. Prior to that he was doing his theology as a young Jesuit scholastic in Lyons, France. He met there Fr. Henri de Lubac, SJ, who was a wonderful priest, a great Jesuit, and tremendous scholar. When it came for Fr. Fessio to do hiw own doctoral studies, and Fr. de Lubac suggested he do his studies on Hans Urs von Balthasar, the Swiss theologian that de Lubac thought was the great theologian of the Church. He said Fr. Fessio should go to Regensburg to study with the great young theologian Fr. Ratzinger and it was Fr. de Lubac who wrote Fr. Ratzinger on his behalf. Fr. Ratzinger made an exception to accept Fr. Fessio among his graduate students even though he’d been trying to reduce the number of students he was accepting. He was a wonderful teacher as the world now knows. After that, his former doctoral students would gather with him every year, especially after 1977, when he became Archbishop of Munich-Friesing. This was called the Schulerkreis or “student circle”. They would go to a monastery, select a theme, bring in a speaker, have discussions, have meals together, Mass together. It was a wonderful opportunity to spend time with their revered mentor. They thought they would end when he became Pope in 2005, but he informed the students that he wanted to continue so they keep going every August. That he continues this, tells Fr. Fessio that he values his friendships he’s made, that he values academic discussion and inquiry in o themes of theological interest, and what a warm human person he is that he enjoys this recreation. Fr. Chris asked what qualities Pope Benedict has a professor and teacher that he would admire. He has a brilliant mind and grasps what he reads and remenbers them forever. Is widely read in many subjects, not just theology and philosophy, but also literature and history and others. HE loves art and music and plays piano. He’s exceptional for the depth of his knowledge and the sharpness of his intellect. He’s also very tranquil and listens well. Most memorable for Fr. Fessio were not Fr. Ratzinger’s lectures, which were excellent, but his seminars. In a group of students, he would lead discussion and make sure everyone got a chance to speak and guide it. At the end, he would summarize the whole session into two very beautiful and long German sentences. They would be astounded at his ability to synthesize and grasp the important themes and put them together. He sees it again and again now that he’s Pope. At the Synod of the Eucharist, where bishops discuss a theme, then put together a synopsis of themes they’d like the Pope to address, and if you read the document Pope Benedict produced, it’s beautiful. When the synod fathers give the Pope their document, they number each item. If you look at the footnotes of the Pope’s post-synodal exhortation, Sacramentum Caritatis, he took all the little fragments that they’d put into their list and he made them into a mosaic; he put them into order; he synthesized them. The synod was one big seminar where Professor Ratzinger listened and synthesized. Pope John Paul II had put Cardinal Ratzinger in charge of the creation of the Universal Catechism and he did the same with that document. Fr. Fessio once made a retreat and meditated on the table of contents of the Catechism. He didn’t read the document, just the table of contents. It is so beautifully organized. It’s not just individual statements of our faith; they are put together as an organic whole. Scot said his reaction when he read Pope Benedict’s first encyclical, Deus Caritas Est, was that the Pope was such a clear writer and to be a clear writer, you need to be a clear thinker. Back when he was Fr. Ratzinger, what was the general thinking of where the brilliant professor Fr. Ratzinger was headed in his life? Fr. Fessio said they didn’t think he would become part of the ecclesiastical structure of the Church. He was a brilliant professor and in Germany that’s a highly revered position and they assumed he would continue a career in theology. In Germany, theologians become bishops. (In the US, it’s canon lawyers.) When he became prefect of the Congregation for the Doctrine of the Faith, the hostile media gave him the image as the Panzercardinal, the great Enforcer, the disciplinarian, harsh and unyielding. When he became Pope, his students rejoiced because as Pope now this wonderful man would be known for who he truly is. Sure enough, in 2005, the journalists all asked what caused the change for him to become so warm and kind and caring. Fr. Fessio said that’s the way he’s always been. They only just finally got to know him. Scot asked him what it was like to have someone he knew so well to be elected Pope. He was very happy and he sort of predicted it. When he looked at all the candidates, he decided that no one else had the name recognition or great talents. And John Paul II had increased the College of Cardinals and made it more international which means there are cardinals from all over the world. If you are good enough to become a cardinal, you know you can’t elect someone on hearsay or a nice impression. You need someone you rely upon or trust or that someone you know relies upon and trusts. Who do all these cardinals know? A cardinal serving in Rome gets to know all the other curial cardinals as well as the worldwide cardinals and because he is such a good person and so fair—even his enemies admire and respect him—it just seemd to Fr. Fessio it was unlikely anyone else would be elected. He was happy for the whole Church. The 20th century was a great century for Popes in his view: from Pius X all the way to Pope John Paul II. We are fortunate to have been alive during two of the greatest pontificates, maybe, of all time. 3rd segment: Fr. Chris said it’s great to discover that the Pope’s new book is #5 on the New York Times’ bestseller list. To what does Fr. Fessio attribute this great success? He said we have the best known teacher on the planet writing a book about the most important figure in human history and that should be of interest to even the readers of the New York Times. Even in these secularized times, there are still people who value a book like this by a man like this. Scot asked the significance of the book in the papacy of Pope Benedict XVI. Scott Hahn says that the “Jesus of Nazareth” project will be the Pope’s great legacy, just as the Theology of the Body was Pope John Paul’s. Fr. Fessio said the project is a work of Pope Benedict’s mature years, is close to his heart, he’s worked on it at great length with great devotion, and it’s on Jesus. He also does something in this book that’s not been done in any major book about Jesus. We’ve had lives of Jesus, but this is not a life of Jesus. We’ve had Christologies, books on the theology of the divinity and humanity of Christ and the function of his being a savior, but Pope Benedict said in the introduction that it’s not his goal to do that. His goal is to present the figure and the message of Jesus in a way that will inspire a personal commitment and give people a certitude about their faith. In the last century, there has been an historical scholarship to find the “real” Jesus, but it always ends up with someone how is wispy and amorphous or someone who represents the pet project of the scholar, i.e. Jesus the revolutionary or social worker. But in this book, he says that that the results of historical scholarship are in now and there’s not much more to say there. What we need to do now is expand it into theological exegesis that recognizes faith as a way of seeing the Gospel. And it stays historical because it’s about a real person who lived. He integrates the results of historical scholarship and the vision of faith and that, Fr. Fessio said, will be a landmark for a long time to come. On the other hand, he believes Pope Benedict’s legacy will be larger than this and it will be marked by two things. First, his greatest love is the liturgy and after he was named archbishop in 1977 he didn’t write any more books. He gave talks and wrote articles that were collected into books and wrote an autobiography, but he in 1990 said he would work on a book on the liturgy. Fr. Fessio believes the book, “The Spirit of the Liturgy”, is the masterpiece on the Catholic Mass. It is the best of any that has been written and he doesn’t see how it can be surpassed in the future. That, along with his motu proprio in 2007 Summorum Pontificum which made the Extraordinary For of the Mass more available, mark a turning point in liturgical renewal which will have a longstanding effect on the Church. Third, you can’t have a healthy Catholic Church without priests. You can’t have a large number of priests without strong bishops who have good solid seminaries. Fr. Fessio said he lived through a dark age of seminaries after the 2nd Vatican Council, which is changing now. For the last three or four years, bishops’ appointments have been men who’ve been willing to stand up for the faith, to take a stand for it, have great talents, and are quite loyal to the Church. This isn’t by chance. Last July he appointed Cardinal Mac Ouellet as prefect for the Congregation for Bishops, the congregation that oversees the appointment of bishops. Fr. Fessio has know him for many years and both were close to Fr. Ratzinger. He’s extraordinary, intelligent, and a man of faith, and he’s in charge of the appointment of bishops worldwide. For the US, Cardinal Burke is a member of that Congregation and he knows the situation in the US and knows priests and bishops and here. Scot asked Fr. Fessio to describe what in Pope Benedict’s and Cardinal Ouellet’s mind makes a good bishop for the 2010s. Of course, they want men of prayer deeply committed to Jesus and his Church. They want bishops with intellectual foundation to defend the faith and be prophetic in proclaiming the Word of God. They also want bishops who can recognize the importance of hermeneutics of continuity, an understanding that the Second Vatican Council is not a break with the past, of everything that went before it. Fr. Fessio has heard a lot of people say, “Oh, that’s pre-Vatican II. We don’t do that any more.” This Pope’s view is that the Vatican council was a moment in the Church’s long living tradition in which there was organic development that was called for, a renewal that was rooted in Tradition. After the council , there were many bishops who thought the council was a complete transformation of the Church. Fr. Chris said that it seems that with the current Jesus of Nazareth book ending with the Resurrection that it wraps up the series. Or is there another volume coming? Fr. Fessio said the Holy Father has promised that he would write a short book (in Italian “fascicolo”) on the infancy of Christ. So there’s the public life of Christ to the Transfiguration and then the Passion, Death, and Resurrection of Christ in two volumes and then a small half-book being worked on now that he hopes to finish it by the summer. Scot asked if Ignatius Press will publish that book. Fr. Fessio said they don’t have the contract yet, but the Pope has been very loyal to Ignatius as Ignatius has been to him. He knows of a New York publisher who went to Rome personally to offer a $2.1 million advance for the book, which Ignatius wasn’t required to pay, but the Holy Father’s publisher said No, that Ignatius Press was going to do it. Scot asked Fr. Fessio why does it have both Joseph Ratzinger and Pope Benedict XVI on the cover? At what level of magisterial authority does he write this book? Fr. Fessio said it is not at all magisterial, in the technical sense of being an authoritative statement for the Church. It is really a book by Joseph Ratzinger as a private theologian, but this man happens to be Pope. So in order to help sell the books and to let people understand, they book both the name and the title. It doesn’t have the Church’s authority behind, but neither does the phone book and that’s full of true statements. So it’s full of truth in that sense even while you can disagree with his conclusions. He has also become what his office is. Joseph Ratzinger doesn’t put on a costume as Pope Benedict XVI. He really is the successor of Peter and he is what his office is. 4th segment: Fr. Chris asked Fr. Fessio what his favorite part of the book is. Fr. Fessio said he couldn’t pick a favorite part. It’s not a book that’s easily divided into parts. It’s sequential as it goes through Holy Week and it’s a story. The whole story is what is powerful for him. In every part he sees wonderful insights and clarity of thought. What he likes most are certain constant features that everywhere throughout the book. Pope Benedict uses the Old Testament in a certain way. He’ll talks about saying and acts of Jesus that may be hard to understand by going back to Old Testament texts in which Jesus’ acts are the fulfillment. But he goes deeper an deeper into the historical context. It’s also so Christ-centered because he shows how the sayings of Christ, his words to us, are actually expressions of the way Christ lived his life. Pope Benedict’s character as a teacher is seen throughout the book. He enumerates many things, he begins with questions and then answer them. He has a teaching style. Fr. Fessio said he’s working on adapting the books into an online college course, working with the College of St. Thomas More in Fort Worth, a fully online Catholic university. Every time he re-reads the books in preparation for these classes, he gets something new. They discuss Scot’s favorite passage of the book on Christ washing the feet of the Apostles. Pope Benedict says it’s an encapsulation of the ministry of Christ, that God stoops down to serve man, that “God did not grasp at divinity, but rather emptied himself and took on the form of a slave.” The bathing of the whole body is also a reference to baptism and feet-washing is a reference to the need for continual cleansing necessary through confession. When Christ washes our feet, it is an expression of an inner reality of service to others, not just to show us who He is, but to gives us an example of who were to be. Now, the Pope goes deeper. Christ knows we can’t do that as an act of our own moral strength. Noting that this takes place at the Last Supper, he says we need to be united to Christ in the Eucharist, then we can let that life flower in us as a moral life. We don’t do it on our own. Fr. Chris said in the foreword of the book, Pope Benedict says he has the task as communicating the figure and message of Christ. Fr. Fessio said that his is against the background of the historical scholarship. Pope Benedict wants to show us that having read the scholarship, there can still be a full concrete attractive image of Jesus, the man who was God, not a shriveled and shrunken image made by questioning everything we know about Christ. He wants to give the fullness of Christ as we receive Him in the Gospels. The message is similar. Some scholars say we can’t be sure of what Christ said because earlier editors could have inserted anything into the texts of the Gospels we have today. But Pope Benedict says we can have a genuine figure of Jesus, filled out and fleshed out and we can have have real teachings of Jesus from the Gospels; we can rely on them. Otherwise who will follow Jesus? No one will follow a stick figure Jesus. About the Resurrection, Fr. Fessio notes that Pope Benedict says with St. Paul that if Jesus isn’t risen our faith is in vain. He also addresses whether the tomb was empty. Some scholars say that Jesus could have died and his spirit rose to heaven and his body decomposed and it would not alter our belief in the resurrection of Jesus. But the Pope says while there could be a resurrection of the crucified Christ without the body leaving the tomb, because it’s a transhistorical, beyond empirical event, but there would have been no belief in it, the Jews at the time knew where he was buried. If they’d gone to the tomb and found a body, it would have been a dis-proof of the resurrection and there wouldn’t have been a belief in Jesus in the early Church. Fr. Fessio said there is a study guide available for the book and Holy Week is a good time to study and pray with this book. He suggests that Holy Week is a good time to get away from the world—Facebook, Twitter, TV, and magazines—and be with the Lord in this special time.